At Home with the Hinkleys: Small Business Saturday? I really put a lot of thought into how I could participate in Small Business Saturday this year, because I really believe in the cause. 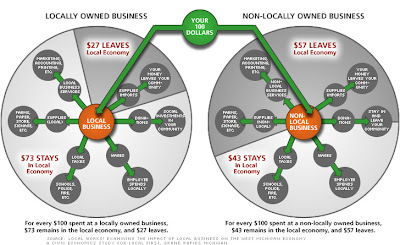 So buying local keeps $73 in your local economy while buying at some big box store corporation only $43 will stay behind in your town. When I got up yesterday, knowing I wanted to participate, I started to brainstorm some local businesses I could patronize. I thought of a bunch, but the problem as well was that Aaron and I are on a kind tight budget from now until January, and needing to get through all the holiday spending I needed to be kind of strategic about what I am buying and not just spend willy nilly. I wanted to go get breakfast at House of Pies, which is my favorite local diner-type-place in town. And pies out the wazoo, in any flavor you wish! 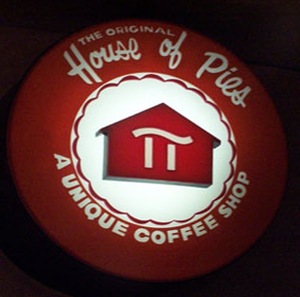 Much to my dismay just now, I learned that House of Pies is actually a defunct chain from the 70's, but there are a handful of them still around. Local/small enough, I guess. I like supporting this establishment also because I think whomever owns the place goes to our church, but that has not been confirmed. But yeah, we didn't end up going because Aaron didn't feel like getting up earlier before he had to get to work. Bummer. Then I spent a lot of the day cleaning the apartment because I meant to do that yesterday but ended up watching TV all day on the couch. Lazy turd! By the time Aaron was getting home at 4pm, I had just gotten ready for my shopping day. So I knew I had to go to World Market because I was on a hunt for an ornament for my swap buddy, and I needed the best ginger snaps in the whole world. 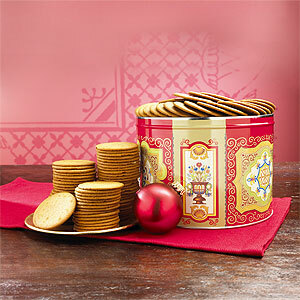 It isn't the Christmas season without them! So I went to that corporate store, then I got dinner for Aaron and I at Pei Wei, another big chain place. I couldn't even go local for dinner. For shame, Natalie! So due to my failure at small business Saturday, I am going to make a concentrated effort to buy small for the rest of the month. Don't write off the big stores all together, a lot of them can maybe carry items that come from your town. For example, I know the Whole Foods grocery store here carries varieties of honey, salsa, BBQ sauce, etc. that come from local people around town. You can't beat yourself up if it is really difficult to get your needs met by local/small businesses. I found it super difficult because I hate spending a lot of money on stuff I don't need, and I don't have the time to go a crazy amount of out of my way to get stuff. Awareness counts for something, and when you are aware, you are much more likely to make a better choice than if you didn't know. Right? Did you participate in Small Business Saturday? I love that you called yourself a "lazy turd". Love the blog! This was very informative! I think often times it's easier and cheaper for me to go to our big corporate stores rather than a small local shop. However, I do agree that it is good to be mindful of the small places too :) Will keep this post in mind next time I shop :) Thanks Natalie! New follower from the GFC Collective: I also am super supportive of small business, even though I've worked for big corps like Costco and Wells Fargo. I've been supporting small buz through online shopping - gotta love it! awesome, thank you! Welcome! :) I have worked for big companies too, and they are why I support small business so much, lol!